No matter how dominant [the Mets] looked in Milwaukee or how feeble Philadelphia appeared in falling to the Nationals, no team is better at lulling its fans into a false sense of security than the Mets. 8/7 Update: At least they avoid a sweep. Because I was traveling, and thereby distracted, I failed to note this blog's third birthday on August 28. It's now reached an age where it can form coherent sentences and go potty without adult supervision. Thanks to all my loyal readers and commenters. My Sitemeter tells me the blog is getting more and more visits and page views month by month. Visit number 25,000 will be coming up before long. I'll have to think of an appropriate prize. iPod log 5: transcontinental soundtrack. This is what I was listening to on American Airlines Flight 16 (see my immediately previous post) from the time the cabin steward said it was OK to turn on electronic devices until turnoff time as we approached JFK (with a small interruption for drink orders). As usual, the iPod was set to play in random order. No extensive commentary, as this is a long list. Incredible String Band, "Black Jack Davy". Ruth Brown, "Mama, He Treats Your Daughter Mean". Richard and Linda Thompson, "Wall of Death". She was pregnant, and they were in the throes of divorce when this was recorded as part of Shoot Out the Lights, one of the most emotionally wrenching rock albums ever. Orpheus Chamber Orchestra, Handel: Water Music, Suite 2, alla hornpipe. Sue Foley, "Shake That Thing". If you think "Canadian blues singer" is an odd concept, listen to this lady. Fleetwood Mac, "Buddy's Song" (see here). Rolling Stones, "It's All Over Now". The series of guitar runs at the end of this song makes me think of Allen Ginsberg's line from Howl: "[T]he crack of doom on the hydrogen jukebox." Stop, Inc., "Second Line". Lively instrumental R&B from the city that dodged Gustav's bullet. International Submarine Band, "Miller's Cave". Gram Parsons' pre-Byrds, pre-Burritos group does a Bobby Bare classic. Aretha Franklin, "You Make Me Feel Like a Natural Woman". The Band, "The Night They Drove Old Dixie Down". Marshall Chapman, "Don't Leave This Girl Alone" (see here). Rod Stewart, "Tomorrow Is Such a Long Time". J. Geils Band, "Hard Drivin' Man". Bothy Band, "The Morning Star/ Fisherman's Lilt/ Drunken Landlady" (see here). Altan, "Come Ye By Atholl/ Kitty O'Connor". John Stewart, "Omaha Rainbow" (see here). Lucinda Williams, "Lines Around Your Eyes". Seldom Scene, "Little Georgia Rose". Vampire Weekend, "Walcott" (see here). Rod Stewart, "Every Picture Tells a Story" (see under Maggie Bell, below). The Maytals, "Sweet and Dandy" (see here). 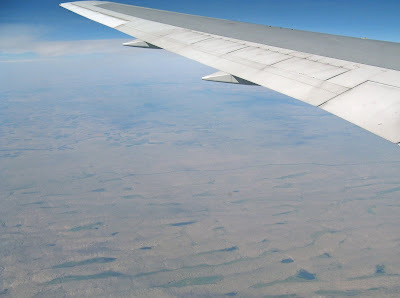 Woody Guthrie, "This Land Is Your Land" (this was playing as we flew over the desolate sand hills of western Nebraska). Planxty, "The Jolly Beggar/ Reel" (see here). Chuck Berry, "Back in the USA". Guy Clark, "Texas, 1947". One of my favorite train songs. Marshall Chapman, "Why Can't I Be Like Other Girls?" Her signature piece (see above). The Mamas and the Papas, "Twelve-thirty". I've loved this song since my first year of law school. Of the original four Ms&Ps, only Michelle survives. Jefferson Starship, "Caroline". Marty Balin opens a vein. Jaynetts, "Sally Go Round the Roses". Weirding me out since 1963. Wolfgang Schulz and Hansjörg Schellenberger: Mozart, "Duet for Flute and Oboe" (Papageno's aria from The Magic Flute). Gram Parsons, "Love Hurts". With Emmylou Harris. Little Richard, "Rip It Up". The Kinks, "Lola" (live version). I first heard the studio version of this song on a flight to California in 1970. Arthur Conley, "Sweet Soul Music". Fairport Convention(see here), "Tam Lin". From the great Liege and Lief album, with the late Sandy Denny on lead vocal. Fairport Convention, "Sir Patrick Spens". Smokey Robinson, "I Second That Emotion". Dylan called him "America's greatest living poet." Fairport Convention, Si tu dois partir (see here). Marshall Chapman, "You Asked Me To". Marshall does Waylon. Beach Boys, "Please Let Me Wonder". The Youngbloods, "Sugar Babe". Part of the soundtrack for Antonioni's Zabriskie Point. Holmes Brothers, "Up Around My Head". Old friends from the days when they played Dan Lynch's on Second Avenue. Otis Redding and Carla Thomas, "It Takes Two". From the great King and Queen album. Adrienne Young with Little Sadie, "Hills and Hollers". Emmylou Harris, "Time in Babylon". Steeleye Span, "Weary Cutters/ New York Girls". The latter features Peter Sellers on ukulele and witty asides. The Kingston Trio, "Utawena" (see here). Royal Teens, "Believe Me". In my estimation, the epitome of adolescent angst songs--even cuts Dion's "Teenager in Love". If you don't (ahem!) believe me, give it a listen. Bob Gaudio, who plays the tinkling piano on this, went on to become one of the Four Seasons and wrote their first mega-hit, "Sherry". Fleetwood Mac, "Go Your Own Way". Fairport Convention, "I Don't Know Where I Stand". The original lineup, with Judy Dyble (also see here). Maggie Bell, "Queen of the Night". Someone once wrote, and I agree, that when she joins Rod Stewart on the line "She claimed that it just weren't natural", in the song "Every Picture Tells a Story", it's one of the most electrifying moments in rock. The Melodians, "Rivers of Babylon". The Bony M version of this was a fixture on the Bells of Hell jukebox. Townes Van Zandt, "Two Hands". I loved this guy. Sad to see him gone so young. Amy Speace, "Double Wide Trailer". Keep an eye on her. Nitty Gritty Dirt Band, "Sunny Side of the Mountain". From Will the Circle Be Unbroken, and featuring Jimmy Martin. Sam Cooke, "Another Saturday Night". Delbert McClinton, "Before You Accuse Me". Wynton Marsalis: Jeremiah Clarke, "The Prince of Denmark's March". The Cellos, "What's the Matter For You?" (see here). Neil Young, "Saddle Up the Palomino". Jefferson Airplane, "Today". This 60s psychedelic love song provided a fitting close to a journey from San Francisco. So, almost five hours of music: seventy two pieces, out of a total of 691 loaded on my iPod at present. This isn't what I consider a truly representative sample: light on classics, rockabilly and punk; no jazz; no hard-core Chicago blues; no Dead or Dylan. Still, a good set for a long plane ride. This is the beginning of the story of a journey and visit, which I'll be posting in pieces from time to time in the next week or so. In my typical bass-ackwards way, I'm starting with the return trip. 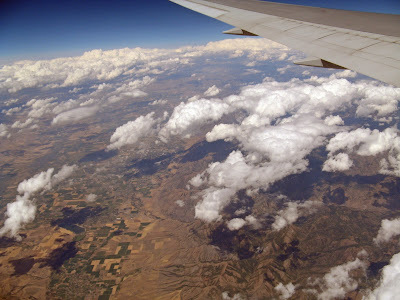 Herewith the photo log of American Airlines Flight 16, SFO to JFK, on Sunday, August 31, 2008. 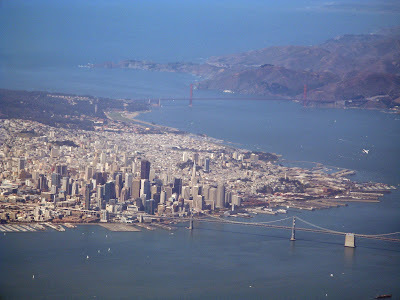 San Francisco, with the Bay and Golden Gate bridges, and the Marin Headlands and Pacific Ocean in the background. 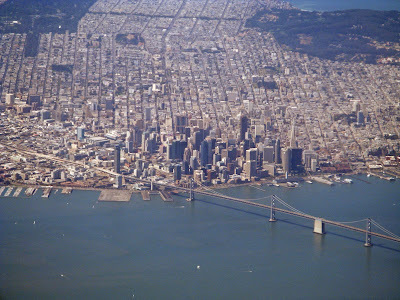 Another view of The City, with the financial district and Embarcadero in the foreground, Nob Hill on the near right, and Chinatown and North Beach (home of the Beats in the 1950s) just beyond that. The green swatch on the right is the Presidio, and that on the left is Golden Gate Park. The thin green rectangle extending below that is the Panhandle; to the left of that is Haight-Ashbury, famed as the hippie neighborhood of the late 1960s. 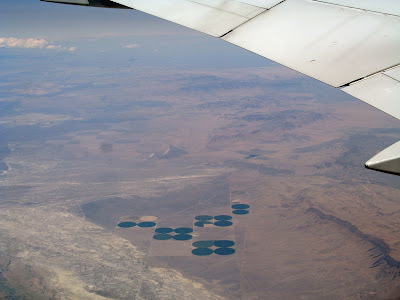 Circular agricultural fields created by center-pivot irrigation systems in a Nevada desert valley. The northern end of the Great Salt Lake. 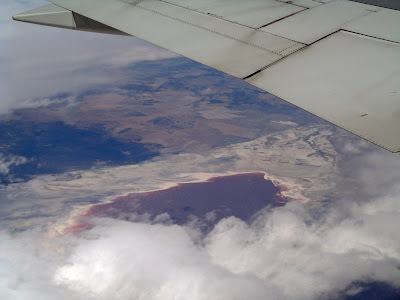 From the plane, the water near the shore of the Lake looked reddish. A fertile valley with mountains (the Uintas?) to the east. Unfortunately,the clouds seen in this photo became a solid overcast (from my point of view, undercast) that hid the Tetons and the Snowy Range from sight as we crossed Wyoming. Sand hills of western Nebraska. 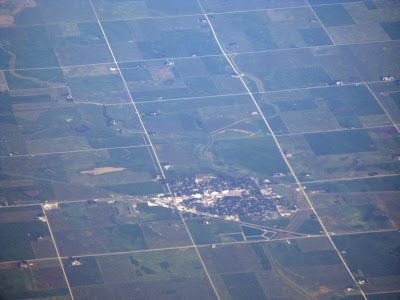 A typical Great Plains scene: small town with grain elevators and landscape divided into square homestead grant sections. 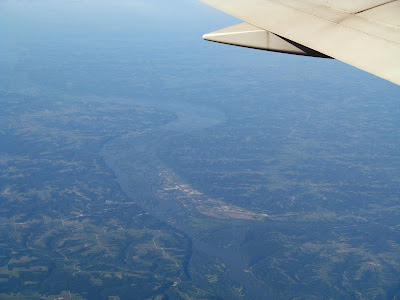 Confluence of the Mississippi and Wisconsin rivers, at Prairie du Chien, Wisconsin. 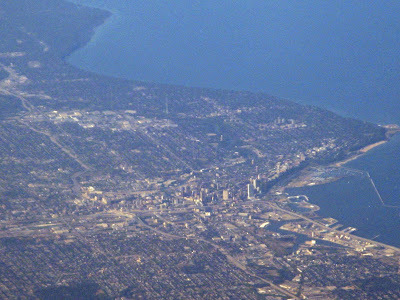 Milwaukee. Wisconsin is one of three states (the others are South Dakota and Oregon) in which I've never set foot. At least now I have a couple of photos from the air. New York's Finger Lakes district. 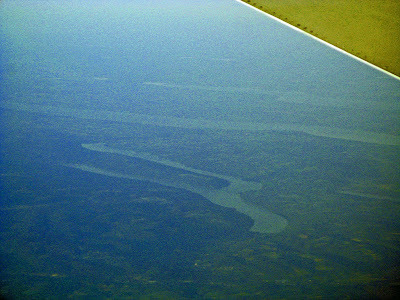 From bottom to top: Keuka, Seneca, Cayuga and (very faintly in the background) Owasco lakes. Hudson River and George Washington Bridge. 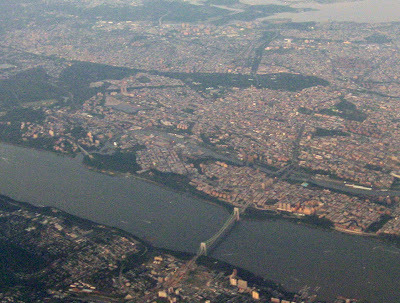 New Jersey is in the foreground, Manhattan in the center, and the Bronx in the background, separated from Manhattan by the Harlem River, which is here obscured by bluffs on the east side of Manhattan. 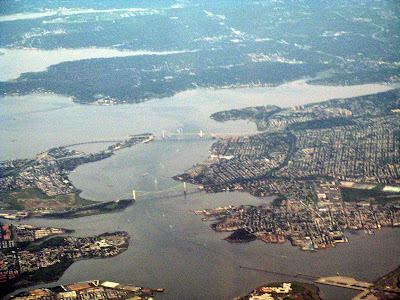 Whitestone (foreground) and Throg's Neck bridges, both connecting Queens (on the right) to the Bronx, with the western end of Long Island Sound beyond. 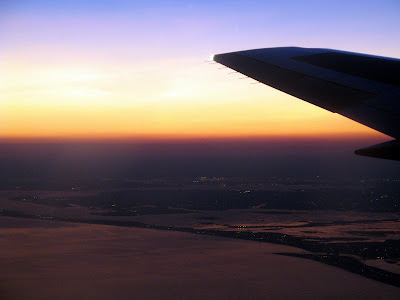 At dusk we were approaching JFK Airport from the south, over the Atlantic. Brooklyn (my home!) is in the background. From "Sarah Jackman" to "Sarah Palin". Can't you just hear it: "Sarah Palin, Sarah Palin..."? "How's your running mate?/ He's a real cheap date..."
"How's your son, Track?/ He's goin' to Iraq..."
So, help me out. Anyone who can come up with a complete song will have my eternal admiration and gratitude, not to mention that of the Democratic National Committee. Update: For more Palin dish, see here.